Who doesn’t like to indulge in silky smooth and creamy chocolate? It can be pure heaven and I for one have no intention of giving it up… ever! Thankfully, we shouldn’t feel too guilty about this pleasure, and if we eat the 70% minimum cacao solids type then dark chocolate and health can be a marriage made in heaven. 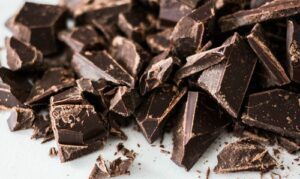 Read on and find out about the little known 5 dark chocolate health benefits that will give you an excuse to indulge in this treat any time you please. The average person eats about 12 pounds of chocolate per year (me more), but most people are eating the low quality, high sugar, high fat versions. Many of these contain so little actual cocoa powder that they have no benefits at all, and in fact swing in the complete opposite direction making them just another a junk food. This is definitely NOT the healthy and antioxidant rich variety that I am going to talk about in this post. For starters you should aim for at least 70% minimum cacao solids when you go on a chocolate buying spree. Most quality brands will tell you on the packaging how much cacao is in their chocolate, so it’s easy to see at a glance what you’re actually buying. You can start yourself at 70% cacao, then build up a bit higher as your taste buds become accustomed to it. I actually prefer 80-85% these days because I’m not craving the sugar in chocolate anymore; and only recently I come across 100% cacao chocolate which I was convinced would be quite terrible, but actually tasted quite nice… bizarre, I know! I find that cacao actually has a sweetish taste even without sugar, but that’s probably because I’m so used to it these days. 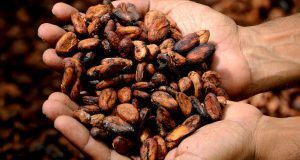 Try to buy organic chocolate where possible as those cacao beans are notorious for being sprayed with huge amounts of fertilisers and pesticides. And it definitely won’t harm to buy some of the lovely new ‘raw’ chocolates that are now on the market as their beans haven’t been roasted and so have all their wonderful nutrients intact. Alternatively, you could buy yourself a good quality cocoa powder and make your own hot chocolate, cakes, or whatever else you fancy putting chocolate into. Later on in the post I shall include an easy recipe for my homemade, super healthy chocolate that contains just a few simple ingredients and is super indulgent. Beware – it’s highly addictive! 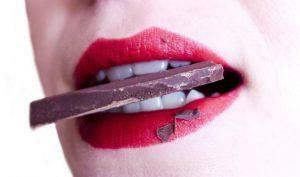 The high antioxidant content of dark chocolate helps to fight free radical damage in the body. This is good news because free radicals steal healthy electrons from our cells structures, causing havoc and damaging DNA as they go, and thus boosting the dreaded aging process which eventually leads to the onset of disease. Cacao is specifically high in the antioxidant antholyanidin, and also epicatechins. These can stop all this bad aging related stuff from happening by disarming those free radicals before they can do any damage. Flavenols have a positive effect on heart health by improving the flow of blood to both the heart and the brain and helping to lower blood pressure. These flavenols also make blood platelets less sticky and harder to clot, therefore reducing the risk of both blood clots and strokes. Dark chocolate also contains cocoa butter, which in itself is a heart healthy monounsaturated fat. There have been many studies conducted on the effect of polyphenols in dark chocolate and heart health including its ability to lower bad cholesterol. Studies suggest that the flavenols in dark chocolate increase blood flow to cerebral matter, making it good for memory, focus, and cognitive performance. Dark chocolate is actually HIGHER in antioxidants than super fruit powders such as acai, blueberry, cranberry, and even pomegranate, which means that you can get all your antioxidants in a seriously tasty treat. Eating dark chocolate alongside a super healthy, highly plant based diet will also lower chronic inflammation in the body and boost your brain power even further. Pairing super foods like cacao (though probably not together) with other antioxidant rich super food powders such as my personal favorite Dr. Schulze’s Green superfood will give you a full spectrum of different antioxidants, phytonutrients, and nutrients for good all round health and vitality. And there’s more good news: these same flavenols are also found in red wine and tea, suggesting that not all good things in life are bad for us – providing we don’t go over board of course! Although the studies in this field are still emerging and with good prospects, it stands to reason that with its impressive amounts of antioxidants and flavenoids, dark chocolate may play a role in the cancer protection and treatment field. Making sure you eat lots of other antioxidant rich superfoods will give you a whole array of nutrients and anti aging petrochemicals that are also crucial to health. Don’t just rely on one thing, make sure you eat a rainbow of colours from various fruits and vegetables every day. Healthy sweetener to taste. I use Xylitol or stevia because syrups will just sink to the bottom. Plus these are low GI sugars. Other optional ingredients of your choice include nuts, seeds, desiccated coconut (my favorite version), dried fruits, OR anything else you can possibly imagine would taste good in a chocolate as long as it’s healthy. Go wild with it and add lots of lovely nutritious ingredients. Heat the coconut oil gently in a saucepan until just melted but not too hot. It’s important to keep nutrients intact by not over heating these delicate ingredients. Add all other ingredients and stir until smooth. Put into a tin pre-lined with tin foil of any size or shape. I use a bigger tin as I like my chocolate to be thinner and have that ‘snap’. Place in the fridge or freezer until set; then enjoy. It’s great to eat from frozen also! If you have any questions or comments about dark chocolate then please leave your message below. Do you have any great recipes for chocolate you would like to share? I’m always happy to hear from you. Thank you for taking the time to read this post and support my plant based eating website. Hi Daniel, I know how hard it is to avoid sugar in this world ha ha. And it’s just so hard to resist as well. If you are going to make your own cacao then I would go for organic powder. There is a brand called Green and Blacks had do a good cocoa powder. 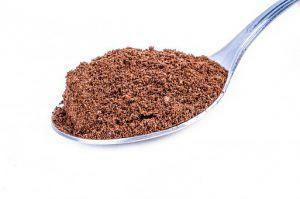 Or, even better but more expensive is raw cocoa powder which you can get in most health food stores or online. The raw stuff has all it’s nutrients in tact so therefore has even better health benefits. Yes, go ahead and make your own chocolate, you will love It! One thing with it though is it really is best left in the fridge at all times as it melts more easily than normal chocolate (probably because it hasn’t been tempered). Good luck. Hi Stefanie, I seem to have trouble getting to your article, just to let you know. But I will come back to your website because I would love to read about the health benefits of dark chocolate because I am a fitness advocate and I emphasize how certain foods are good for us. Hi Marques, sorry about that, my site is back up and running now so would be happy if you could take a look and leave a comment. You will find it very interesting if you are a fitness advocate…as am I.
Hello, so who says that life cannot be a chocolate party?? Grin. I have a question though, I had to give up chocolate about 20 years ago because of the caffeine content. Does the organic raw still have natural caffeine levels? Hi Ariel, that is a great question because I find I cannot eat more than about 50 grams a day due to the caffeine content, and I would definitely advise against eating too much dark chocolate in the evening, just as with tea and coffee. In fact this is such a good point that I am going to go in a revise the post to include this information. And yes, the organic raw still has caffeine, but I find it doesn’t affect me in the same way as the normal stuff. Somehow because it’s in a more natural form it seems to process differently in the body but I have no evidence of this, just my own experiences. So you may want to give it a try for yourself, just start with a little and see how you feel. I’m pretty sure, as with most things, it is a case of starting with a small amount as you will be more sensitive until you get used to it. I have always been mindful of chocolate with the fear that it might have health risks. Now I know better, happy to enjoy my yum yum chocolate. But is there a limit to how much I could have a day? Hi Peter, in answer to your question about how much you should have I would say yes, there is a limit as cacao, although high in antioxidants and all the other wonderful things discussed in the post, it also contains caffeine, and so you should take this into consideration if you have problems sleeping or with anxiety issues. My advice is to not consume it in the evenings and just eat in moderation. I definitely wouldn’t eat more than about 50 grams a day of the really dark stuff. Thanks for telling us more about chocolate. It’s actually awesome the number of good properties that it has. Making my own chocolate seems like a great idea. I think I’ll follow your recipe. Hi benjamin, thanks for reading. Yes chocolate is just Gods gift to us if you ask me which is why I like to make my own healthier versions. Yes, definitely give it a go, you won’t regret it if you do I’m sure. Let me know how you get on. Wow! I like your 5-minute chocolate recipe. I have all ingredients and I am going to make this chocolate. I tend to limit intake of chocolate but there are so many benefits of dark chocolate that it seems better to eat it than avoid it. Thanks for the great post! Hi Blanka, yes I’m a self confessed chocaholic which is why I need to make sure that I make healthy versions of the stuff. It’s just so addictive, but in a good way. Yes, definitely go for it and make this homemade version. I would love to know how you get on! Wow, what great information. I wasn’t aware that dark chocolate has so many great health benefits. I will share it with others, such a nice and very well written article. Hi Sarah, yes dark chocolate is awesome! I have a bar of it every day, I am an addict, what can I say. It also gives me a boost of energy which is why I often crave it in the afternoon when I have that dip. Glad you enjoyed the article and thanks for your comment. I followed the chocolate to your post, and appreciate the points you make! I want to follow up with that recipe, but would need to buy the cocoa powder, first. Thank you! Hi Lyn, really glad you liked the post and yes, get the cocoa and try this lovely chocolate. It’s a staple in my house. You had me at homemade chocolate! In my last home there was a very popular chocolate shop that made only raw chocolate candies…they were outrageously delicious. One in particular, a chocolate covered fig, usually sold out by noon. I think I’m finally gonna try to make it myself with the help of your recipe. thanks! I know, it’s definitely ALL about the chocolate ha ha. I love it so much too which is why I am glad I can have it still on my healthy eating plan. You should definitely try and make your own Penelope as I’m sure you will love it like I do. Good luck! Great article Stefanie!! I love eating dark chocolate and these 5 points just confirm it for me now. Thanks heaps for the info. Hi Bill, I’m glad you enjoyed the article. I’m very fortunate that dark chocolate has so many health benefits as I am a self confessed chocoholic ha ha. At least we don’t have to feel to guilty about some of life’s little pleasures at least. Thanks Stefanie for sharing this. I love chocolate! Glad to know it’s a good thing to love in moderation, of course. Hi Linda, I know I love it, can’t live without the stuff! It must be a girl thing ha ha.